Jackpot Deuces Poker is played with a standard 52 card deck. However, the Deuces in the deck are wild and stand in for cards of any denomination and suit to complete a winning hand. The Deuces are cards with a face value of two. Whenever you are dealt a Deuce, it is automatically assigned a denomination and suit. This gives you the highest possible payout for the cards you are holding. 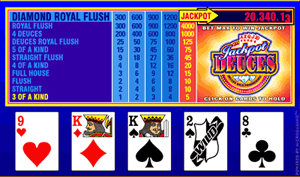 Jackpot Deuces Poker is a Progressive video poker based on the standard rules of Deuces Wild video poker. Jackpot Deuces has a Progressive Jackpot that is activated when you bet five coins.